People find JapanCulture•NYC online and send us event and story ideas, something we appreciate and welcome. More often than not it’s a familiar subject, but occasionally they introduce us to new and intriguing aspects of culture, Japanese or not. 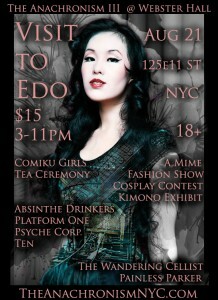 Recently Psyche Corporation front-woman Psyche Chimère asked us to promote The Anachronism presents Visit to Edo, a Japanese-themed steampunk event taking place at Webster Hall on August 21. Since the event has a Japanese theme and is also a fundraiser for Japan earthquake and tsunami relief, we’re including it in our Events & Happenings section. However, we wanted to know more about steampunk, the event organizers and why they chose Visit to Edo as a theme for their event. To get the scoop, we spoke with Psyche Corp’s Psyche Chimère, a co-founder of the Anachronism, the first big steampunk event held in Manhattan. JapanCulture•NYC: So, for the uninitiated, what exactly is “steampunk”? Psyche Corporation: Steampunk is a genre that has evolved over time to mean a lot of different things. In the past, I believe it was most strongly represented in literature, such as the works of Jules Verne and H.G. Wells: Science fiction as envisioned by people of the Victorian and Edwardian era, populated by characters who spoke like people from the authors’ time period, but who had more impressive technology. Technology, which often – though not always – in hindsight we can enjoy in the 21st century, would probably have been impractical or infeasible. Some in the steampunk community have seized particularly upon the steampunk style as a rebellion again the Mass-Production era of today, and as a mode through which to embrace the DIY movement. So no, let’s try to be careful about “What Exactly is Steampunk” because the moment you try to give an exact definition beyond Scifi with NeoVictorian sensibilities, or just Geekery with NeoVictorian sensibilities, you’re liable to have a ridiculous number of people jumping down your throat because you excluded them from the community with your overly narrow-minded definition. That said, there are other people who say steampunk is like finding a super advanced ray gun, only it’s like 50 years old and dusty. It’s not just super-advanced technology, it’s super-advanced technology you find in an antique shop, or at Grandma’s garage sale. Futuristic history. JapanCulture•NYC: How does steampunk’s European/Victorian aesthetic mesh with neo-Tokyo’s technological aesthetic? Psyche Corporation: Tech-fetish with the proper styling is totally steampunk-friendly as it fits quite nicely into the Geekery aspect and the obsession with anachronistic technology (read: way post-Victorian tech) decked out with Victorian stylings. So neo-Tokyo’s technology aesthetic combined with a European Victorian aesthetic really works quite perfectly to give birth to a steampunk hybrid. Also, a LOT of modern steampunk has roots in Japanese anime, which in many ways was a trailblazer in popularizing the steampunk aesthetic . . . When you go to steampunk conventions it’s fairly common to see people wearing things they order from sites like fanplusfriend, which is known for making cosplay outfits based on anime. JapanCulture•NYC: I’ve read that most people associate Japan with cyberpunk rather than steampunk, so how did the theme “Visit to Edo” come about? Psyche Corporation: Visit to Edo was because Webster Hall itself is concerned about raising money for relief efforts in Japan and asked its two most major art/culture events, Anachronism and QAS [The Quarterly Art Soirée] to combine forces for such a fundraising event. Since Anachronism is primarily a steampunk event, we needed a Japan-related theme that would still allude to our neo-vintage aesthetic. Hence, we chose the Edo period of Japan, fraught with samurai and other interesting historical elements bursting with potential for steampunk reimaginings. Given more time, I would have tried to go for a more anime-centered theme, as there’s a huge anime community in NYC as well, and I feel like anime houses a whole family of steampunk, but it ended up being the case that we had more historical resources this time around. We’re still having a Cosplay Contest and a Cosplay Burlesque, though. JapanCulture•NYC: It could be said that William Gibson introduced cyberpunk with his book Neuromancer. What’s steampunk’s equivalent? Where are steampunk’s roots? Psyche Corporation: I guess Jules Verne’s 20,000 Leagues Under the Sea and H.G. Wells’s The Time Machine are the most famous. [callout title=The Anachronism III: Visit to Edo]Sunday, August 21 from 3:00 p.m. until 11:00 p.m. This 18+ show at the venerable Webster Hall includes a performance by Ten, a Queens-based hard rock band that features the koto, a traditional Japanese classical stringed instrument. The Butoh Rockettes bring their modern take on the existentialism of the art form of butoh. Convention panelists and artists Comiku Girls will host a Japanese tea ceremony, and there will also be a kimono exhibit and a cosplay contest. A portion of Visit to Edo’s proceeds will benefit several charities for Japan disaster relief, including Beyond Victoriana’s Rising Phoenix Fundraiser for Japan.